Tags: Autumn, blind hiker, outdoors, Randy, success. 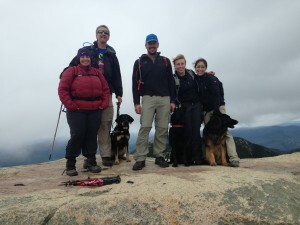 Chocorua: An Autumn Hike with Friends! Autumn had previously climbed Mt. Agamenticus with students from S. Berwick Middle School, Pack Monadnock with a film crew for a documentary premiering in Maine this October, and Avalon, Field, and Tom with long-time friends. On this her fourth hike, she got to hike with Mom (Tracy! ), John, Michelle, Kat, and of course that rather tall blind guy she kindly chooses to guide. Perhaps of higher import to many of the team, Michelle’s dog Dina and John’s Guiding Eyes-released Frisco were also taking the journey with us. As the season of autumn draws ever closer, the mountains are already gifting cooler days which are ideal for hiking. The clouds were dramatic early while the weather only suggested a chance of rain showers later in the afternoon. We gathered a little later at the trailhead of Champney Falls and set to the gentle first miles of trail. Autumn had been whining in excitement from the moment we stepped out of the car and had a bit too much eager determination to get into the woods. Putting the harness onto her calmed her down a bit, but not enough. A short but human-guided rock-stepping stream crossing started the trip and probably put her focus even a little further away, such that the first few hundred feet of work along the trail suggested she was tending her job but at a slightly more distracted level than is ideal. I was making efforts to gain a better focus and enjoying that we were quickly traversing the easier footing when the first stumble arrived. She quickly was reminded that it was time to put her full attention on the job and aside from a few too tempting sniffs on the side she did this very well. Kat and Michelle had last seen my hiking when we finished our 48 on Mt. Liberty and Flume. Both quickly shared kind compliments on how far Autumn had come in such a short time. There’s no doubt that the learning and work done with Quinn enables me to be more aware of all the subtle aspects of possible Dog Guide communication through the harness. We glided nicely along for much of what many would struggle to believe is possible for a Dog Guide team. It does make me reflect in some appreciative humor on how many cues Quinn likely gave to me early which I was slow to learn. Despite this, Autumn doesn’t have it exactly easy as she not only fills big paw-prints but has some serious work. The cascading Champney Falls were a pretty side trail diversion which began the more challenging part of the route. Autumn’s confidence to guide forward no matter who is in front or behind paid some dividends as Tracy is freed to hike at her best comfort rather than needing to stay in front as Quinn effectively required. A few stretches of trail were difficult enough and Autumn had worked hard enough that it made sense to give her a break and call upon a human Guide. Michelle undertook her first round of that leadership and adapted naturally to the many new perspectives and approaches required. I’ve become steadily more easy to guide as my understanding of trails and my own work grows but I’m always amazed by those willing to undertake the focus, effort, and attention to be a human Guide. Autumn was quite happy to resume her role and bring us ever closer to the summit. The final half mile or so of the trail is up a moderately challenging summit cone and ensures all who travel get an appreciation for the work required. Here Autumn did some guiding and John did some guiding as we attempted to keep peak efficiency. Clouds were getting more dramatic and we wanted to enjoy the windy and cool summit prior to getting into tree cover for lunch. The summit was surprisingly crowded with hikers and dogs despite the trail having been lighter. Autumn’s distraction value was too high for safe work when combined with the realistic challenge we were facing. It was work to get her attention and a reminder why training is on-going in all facets of our work. At the summit it was time to relax and appreciate the accomplishment, each of us in our own way. For Autumn it was a surprising indiscretion as she truly marked her territory in the ways of generations of the canine species! 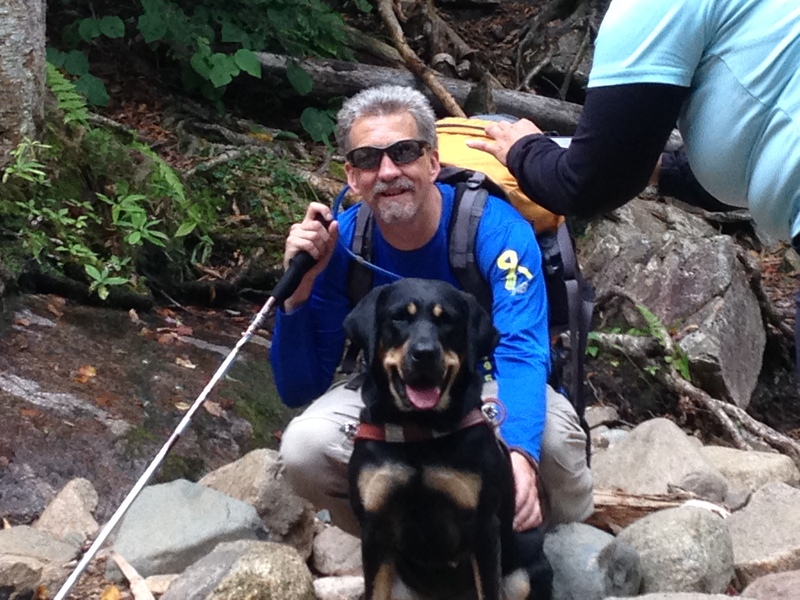 For the generally more difficult descent, teamwork came in as three dogs were juggled on leash by Kat, Michelle, and Tracy while John helped me manage the most challenging of the down terrain. Lunch was a joyous celebration of food and pup interactions as we found a fairly private slab of stone to savor all that a mountain’s majesty inspires within us. I attempted to work Autumn down the difficult dance of stopping for steps as I felt them out and then guided ahead. She did well for a bit but showed that mentally it was more demanding and she grew weary. John swooped in as the stunt double and Autumn was happy to be a bit of a dog as John’s skills at guiding enabled us to quickly traverse most trails. We kept up with the group for the most part and all had one of our strongest hikes. When late on the trail rain began to pelt the tree canopy over us, we still kept sufficiently dry as to fully appreciate the day. Only as we cleared the final stream and reached our cars did the rain begin heavier and by then it was off to Flatbread Pizza Company and a guilt-free repast worthy of any hiker’s feast! Sometimes, it’s just about enjoying life and the friends with whom we share the trails.